For all of you who love fruitcake or a good fruit bread, this is the perfect Paleo replacement. The basis is almond butter and there is no added sweetener. You can change up the ingredients depending on your personal likes and dislikes. This recipe is based on a recipe from Elana's pantry, cranberry almond loaf. 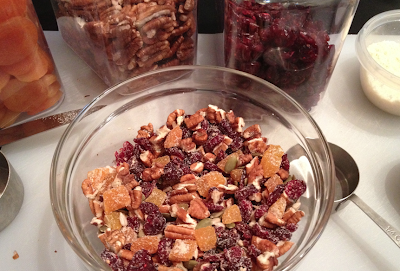 I love this recipe because it's not too sweet which allows the flavours of the fruit to come through. 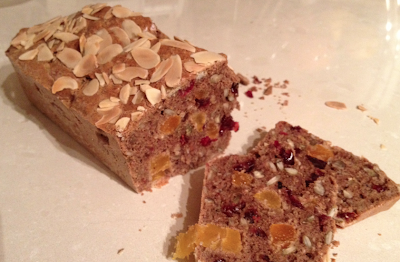 It's also much easier to make than real fruitcake, but just as tasty. 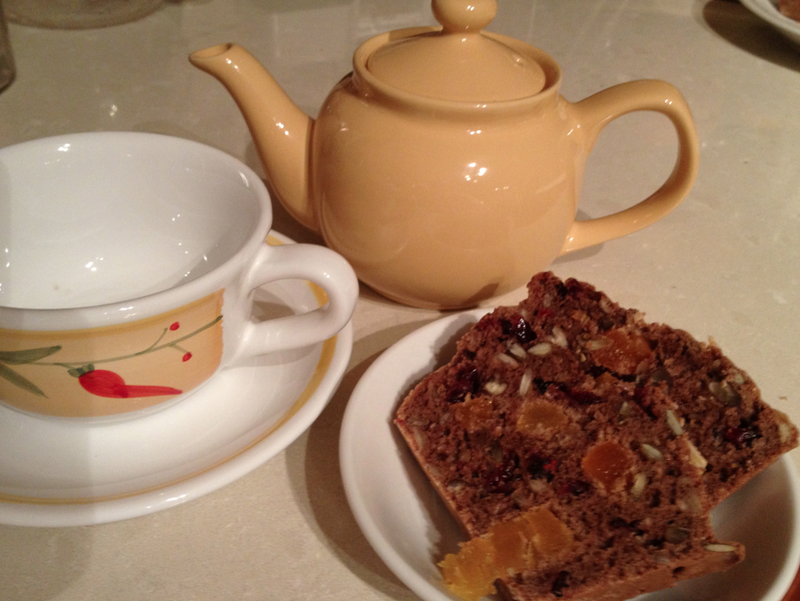 Try it toasted with a good cup of tea .... and maybe a slathering of cream cheese for a real treat. If you have any problems finding ingredients, they are all available online. 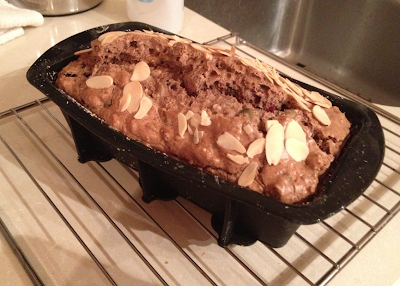 Grease a 5.5" x 3.5" small loaf pan with olive oil. Line with a piece of parchment paper and grease this as well. Then add about a tablespoon of the almond flour and shuffle it around until you have floured the bottom and sides of the pan. Combine all the fruit, nuts and seeds in a small bowl and mix in a tablespoon of almond flour. This will keep the fruit from sticking in clumps and make for more even distribution. Set aside. 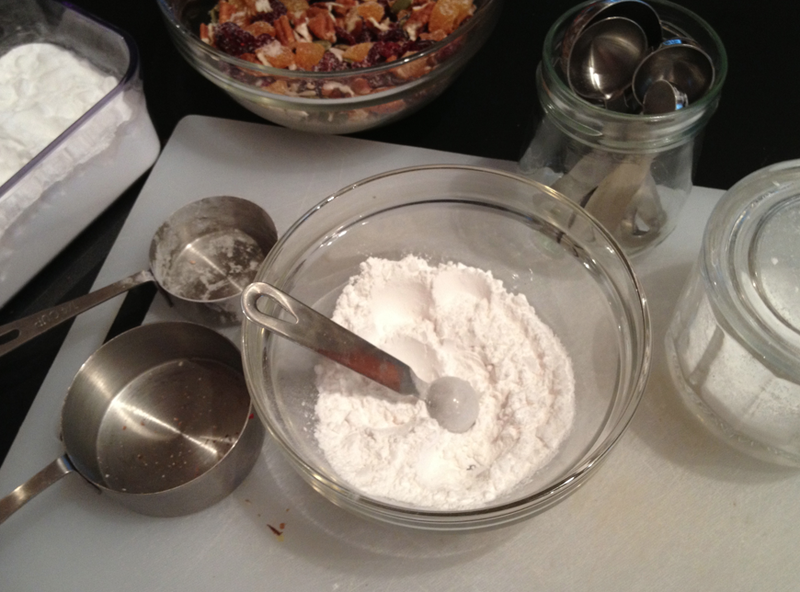 Now combine all the dry ingredients in a small bowl. Set aside. 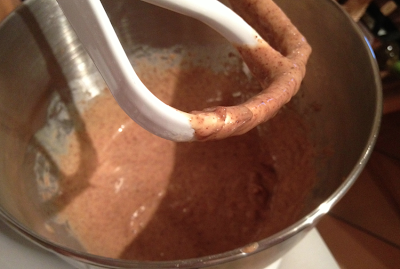 In the bowl of your stand mixer**, blend the almond butter, olive oil and eggs until smooth, scraping the bottom and sides after a minute to make sure all the ingredients are incorporated. Add the dry ingredients and mix in until thoroughly combined, again scraping the sides. 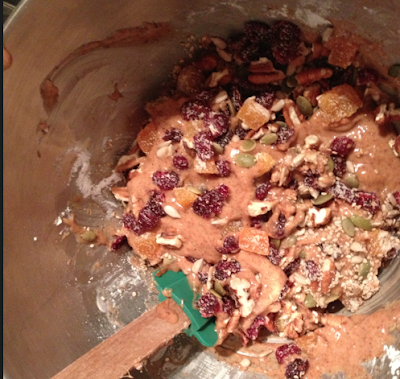 Remove the bowl from the mixer, then add the fruit mixture and fold into the batter. 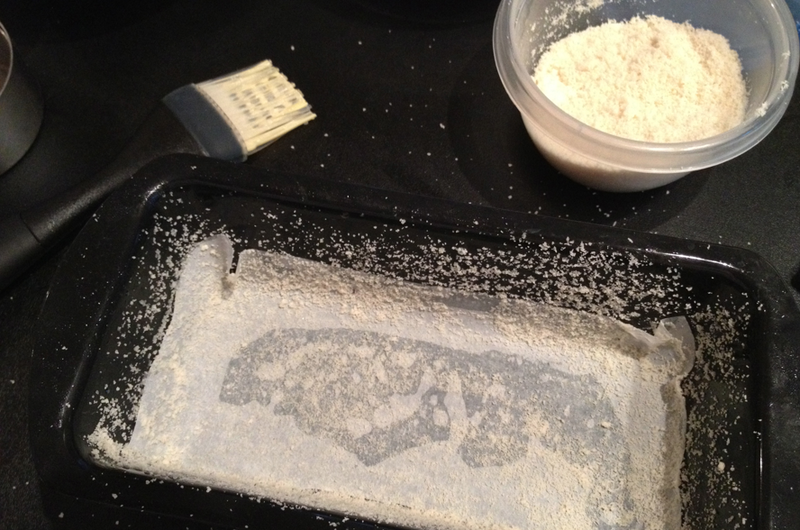 Transfer the batter to the prepared loaf pan. Sprinkle evenly with the sliced almonds and bake for 40 to 50 minutes, or until a knife inserted into the centre comes out clean. Let the bread rest on a rack for about 5 minutes, then remove from the pan and allow to cool completely before slicing. * To toast the sliced almonds, put into a small non-stick pan over high heat and stir constantly with a spoon until the edges start to brown. Watch carefully to make sure they don't burn. Cool completely before using. 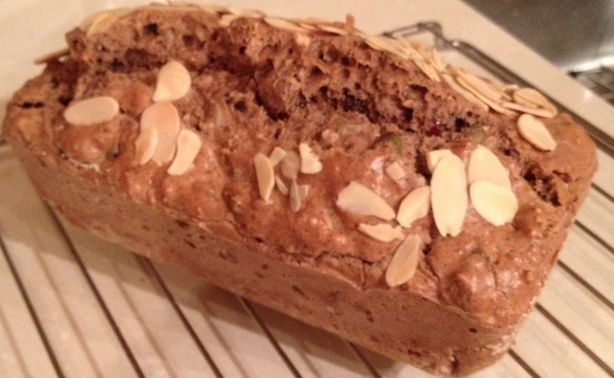 ** You can also make this with a hand mixer - see Elana's original recipe cranberry almond loaf. The end result might be a small loaf but it's very filling. I find I get about 10 to 12 slices, and it will keep for up to a week in the fridge. 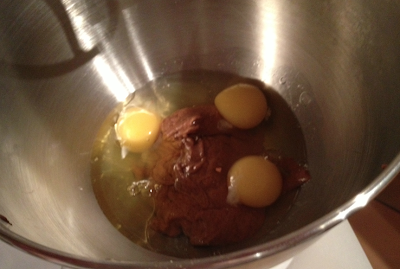 You can also wrap the slices individually and freeze them for later use.